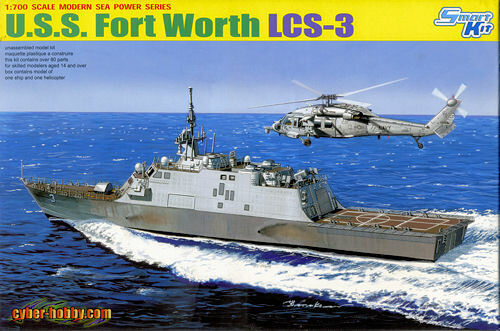 USS Fort Worth (LCS-3) is a Freedom class littoral combat ship of the United States Navy. She is the first ship to be named after Fort Worth, Texas, the 16th-largest city in the United States. Her name was announced March 6, 2009. This was after a long public relations campaign by United States Representative Kay Granger, former Deputy Defense Secretary Gordon England, and others. The ship was built by Lockheed-Martin. Her keel was laid on July 11, 2009 during a ceremony at Marinette Marine Shipyard in Marinette, Wisconsin. Fort Worth includes additional stability improvements to deal with issues found on USS Freedom (LCS-1). Lockheed Martin announced on June 15, 2010 that the ship was at its halfway point in construction was on schedule to be delivered to the Navy in 2012. The 80% completed ship was launched by its contractor on 4 December 2010. The vessel underwent sea trials in Lake Michigan during late 2011, with the completion of these trials announced on October 24, 2011. The ship successfully completed its acceptance trials, which also took place on Lake Michigan, on May 4, 2012. The inspectors only found ten severe deficiencies during the trials, an "exponential" improvement over Freedom. The improvements to the ship include a lengthened hull, which makes her faster than Freedom and ten percent more fuel efficient. Fort Worth was commissioned in Galveston, Texas September 22, 2012. This one adds to Cyber-hobby's growing line of 1/700 ships. 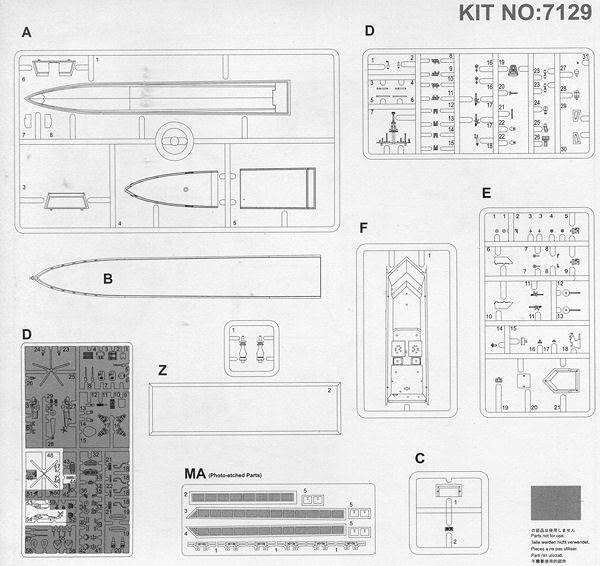 I should state right off that since I have not previewed the 1/700 LCS-1, I cannot tell if the additional length has been taken into account on this kit. One thing you notice is that there are a fair number of parts. That is, until one realizes that one sprue is used for only the helicopter, and even that has to be modified as it is not the ASW version as provided on the sprue. The kit does include a nice photo etch fret. What this has are the safety netting around the flight deck, shields for the small caliber machine guns and the guns themselves. It would have been nice to get railings for the front and the area above the bridge, but you will have to source those out yourself. Most of the kit bits will be placed atop the superstructure. These are mostly antennas of various sizes and shapes as well as various small guns and the secondary armament. There are also some tubes that would be for smoke or perhaps grenades of some sort. The hull itself is a single piece onto which a foredeck with main gun, superstructure section, and flight deck are placed. The rear end of the ship is a separate piece. Total length of the kit will be around seven inches so it is not what you would call tiny. As with most other Cyber-hobby ship kits, this can be built as a full hull or waterline. One simply leaves off the lower hull section for the waterline. Those wanting a full hull ship will have a base with finials that fit into holes in the lower hull. The lower hull also includes the water jet propulsion pieces. Instructions are only nine steps on the inside of a single folded sheet. 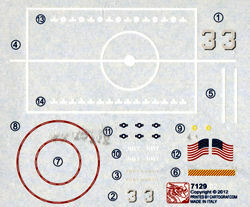 Decals are provided for the Fort Worth and the color chart is for both Model Master and Gunze paints. In all, it is another superb modern ship and since it was commissioned but a month back, you cannot get any more current than that!